I attended the three-day A11y Camp extravaganza in Melbourne in October – the biggest and best they’ve run to date. Here’s my round-up. In the morning, Lainey Feingold (@LFLegal) ran a fantastic workshop on structured negotiation, complete with role-plays. In another room, Russ Weakley (@russmaxdesign) spent the day taking developers through WAI-ARIA. 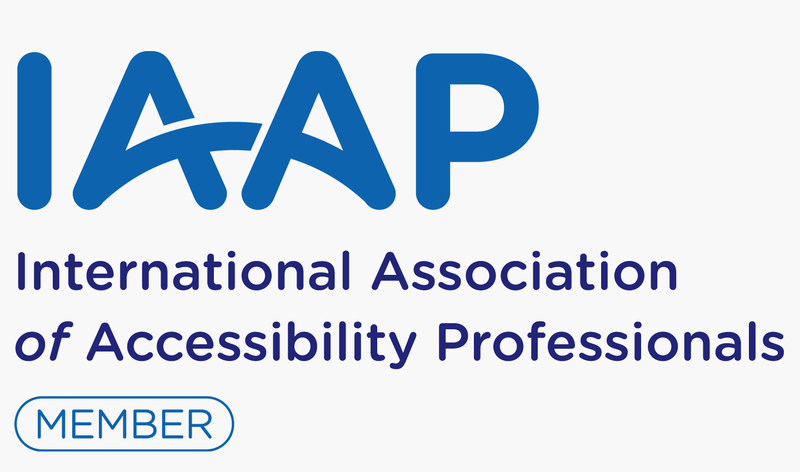 Thursday: the A11y Camp conference! Thursday was conference day! It was huge – about 180 people attended. Renata Zanetti from Intopia delivered the pre-program “Hitchhikers’ Guide to Accessibility”, a handy primer for those attending A11y Camp for the first time. The main program kicked off with a couple of keynotes. Sarah Pulis (@sarahtp) gave the welcome to country and told us about lots of A11y Camp features: captions by @accessinclusion, Auslan interpreters, Aira augmented reality by @airaio, and sketchnoting by Matt Magain @mattymcg of Sketch Group @SketchGrp. She then introduced the first speaker. Lainey Feingold: Dreams. Fears. Accessibility. Lessons from the US Legal System. Fresh from her structured negotiation workshop the day before, Lainey gave us an alternative angle to accessibility in the US, far removed from the “sue everyone!” attitude we often hear about. In fact, she barely mentioned the law. She talked about some of the people in the blind community that she’s worked with. She reminded us that accessibility isn’t about technology; rather, it’s about the people that use the technology. Lainey told us we should see accessibility for the innovation that it is. If solving a human problem is the driver, then the legal compliance should naturally follow. It was a wonderfully uplifting start to the main program. The Australian Human Rights Commission’s (@AusHumanRights) Disability Discrimination Commissioner, Alastair McEwin (@almcewinddc) started with a surprising story about a shark in a swimming pool! He then reminded us that while accessibility is improving slowly, it will always struggle to get traction while our system is based on individual complaints. Rights are not pie. Don’t be greedy. After morning tea, I went to hear Russ Weakley compare techniques for linking text fields to hints and errors. Russ explained the difference between using wrapped labels, aria-describedby and aria-errormessage for inline errors, complete with test results for nine (!) browser/screen reader combinations. He discussed aria-live for alerting error messages. He also covered inline hint techniques: placeholder, wrapped label and aria-describedby. Julie Grundy (@stringy) tackled a huge technical challenge in 20 minutes: build an accessible date picker. It was a great demonstration that complex components can be made accessible with a systematic approach. Julie shared the link to her slides and date picker code and invited us all to use it, enhance it, and share the love. 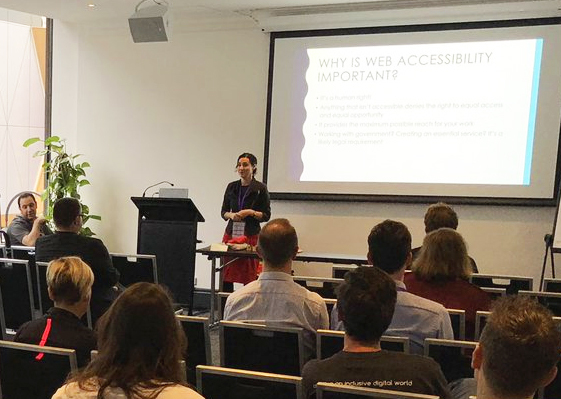 Amir Ansari (@amir_ansari) and Kira Eviston (@kira_eviston) from Transpire (@transpire – an A11y Camp sponsor) used real world lessons they’ve learned about building accessible mobile apps. They’ve written a baseline acceptance criteria checklist for developers, they do internal testing and they test usability with diverse users (sometimes with Intopia Connect). Fighting off technical gremlins that bedevilled the projector, Kira demonstrated a well-structured contextual screen reader label for the announcement of flight details. Instead of four seemingly random times, users could clearly differentiate each of the original and revised departure and arrival times. Nice! After lunch, Ross Mullen (@MrRossMullen) from CANAXESS covered accessible chatbot principles. I thought he couldn’t possibly do it in 20 minutes but I was (happily!) proven wrong. In short: choose a customisable platform, make the conservation history identifiable and navigable, ensure messages are announced, make all rich media accessible, and provide a chatbot skip link. Ross wrapped with a neat story: while testing CommBank’s CEBA chatbot, he asked it “What’s the meaning of life?”, expecting a “huh?” response. Instead, it gave him details of mental health support services. The bank knows some people contact them under financial/emotional stress and has added responses to handle the situation sensitively. Steve Cooper (@DeveloperSteve) from @TelstraDev (another Camp sponsor) talked about the Internet of Things (IoT) and its implications for accessibility. There are a ridiculous number of devices in the world, and their number and sophistication are growing exponentially. According to Steve, the key is the libraries that drive them. If IoT devices force us to adjust our behaviour to interact with them effectively rather than the device accommodating us, then it’s an accessibility and usability fail. He shared a few articles for further reading on IoT and accessibility: devstev.es/read5, devstev.es/read6, devstev.es/read7. On one side, you’ve got the assistive technology. On the other, you’ve got the *nasty* application. In the middle, you’ve got the accessibility framework. It’s the glue that makes it all work. Sean took us through the steps that occur when a web page is loaded while a screen reader is listening, from populating the document object model (DOM) through to the screen reader using the accessibility API to send events to the browser. He showed us the accessibility tree in the developer tools of Firefox and Chrome, so developers don’t need to know how to use a screen reader to perform basic “Name, Role, Value” checks. Mark Barlet (@markbarlet) of AbleGamers (@AbleGamers) talked about how he became an accessible gaming advocate. He went straight to the top, getting the attention (and eventually, cooperation) of major game studios Blizzard (World of Warcraft) and Rockstar (Grand Theft Auto, LA Noire). AbleGamers surveyed 230 gamers with disabilities to understand who was playing (disability), how they played (assistive technology), who they played with (solo/friends/strangers), and the type of play (solo/co-operative/competitive). The raw stats are online (PDF), as is the full paper “Characteristics and Motivations of Players with Disabilities in Digital Games”. Why do we play? To have fun, relax, be part of a community, challenge ourselves, escape reality, and socialise. Sounds like something we should all be doing. The final talk of the day was Karl Groves (@karlgroves), and he presented stats collected by Tenon (@TenonAPI) about the accessibility mistakes the internet keeps making. Level A is the most commonly reported WCAG level, and the most commonly reported WCAG principle is Perceivable. Most issues aren’t platform-specific (phew!). 90% of issues were detected by 20 of Tenon’s tests, and 80% of issues were covered by just 12 tests! 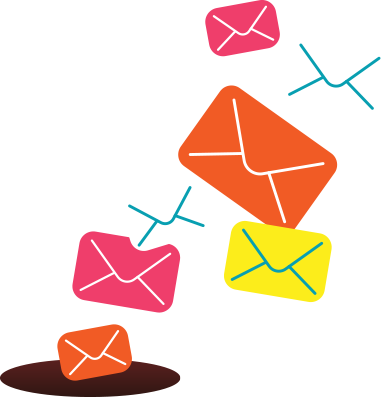 The big themes are: Link quality, text alternatives, insufficient contrast, object labels/label quality, and table/header structure. Karl recommends early accessibility testing. In fact, he said “if early is good, earlier is gooder.” He also gave those that claim they have “accessibility problems” a reality check. A sobering thought to finish the day. Go forth and make it better, people! And that’s a wrap for Thursday! Karl theorised that he didn’t get too many audience questions because we were hanging out for beer. Personally, I was hanging for a donut. What a great way to finish a huge day of accessibility and inclusion! Donuts for all and a few drinks too. Lots of people stayed on to compare notes and hatch plans to take the accessibility vibe back to their workplaces. Since I couldn’t be in two places at once, I was disappointed to miss out on talks by Ashlea McKay, Jessica King, Zoe Paleologos, Damian Keeghan, Jason Kiss, and Liz Gilleran. I heard great things about all of them, dammit. My A11y Camp wasn’t quite done – I still had a day of accessibility testing with Karl Groves. We split into groups to create personas with diverse abilities. Ours was Margaret, a lawyer in her late 20s who was single and looking for love! She was also born blind, so we had to consider all of the subsequent topics from her perspective. This was a great exercise for less-experienced attendees – they had to work through alternative interaction and comprehension models they hadn’t previously considered. We covered all of the big topics: images and non-text content, keyboard accessibility and focus control/visibility, document structure, navigation, colour, and forms. The groups discussed the different ways that each of the personas would be affected, and how they would check that each persona could achieve their goals. At the end of the day, we had a big list of “Ensure that…” and “Don’t do…” items that could form the basis of an accessibility testing checklist. The emphasis all day was on making a usable product, not just a WCAG-conformant one. By Friday night, I was spent. My brain was simultaneously fried and inspired by A11y Camp. I caught up with lots of friends and met some new people as well. We commiserated over accessibility challenges we’ve encountered and celebrated the wins we’ve achieved as well. I think it was awesome. If you were there, I hope you agree. If you weren’t there, please start planning to come to A11y Camp Sydney 2019. Can I use Firefox with JAWS and/or NVDA?